Have you been searching for used car dealers in Terre Haute IN that offer a great variety of used cars, used minivans, used SUVs, and used pickup trucks for sale near me? When it’s time to decide on what your next vehicle is going to be, do you know which car dealer in Terre Haute, Indiana to go to? Terre Haute Auto is the only car dealership in Terre Haute, Indiana that you need in your search for a full inventory selection of used cars for sale in Indiana. The car dealership in Terre Haute of Terre Haute Auto has such an expansive range of used cars for sale to choose from, including used pickup trucks for sale near me. With such a complex variety, the selection they provide should be able to please almost anyone's taste. At the car dealers in Terre Haute, Indian of Terre Haute Auto, we have a significant amount of brand-named automakers. We aim to provide the best-used car shopping experience around. With such a large selection of vehicles, it's no wonder people all over Indiana pass up other car dealerships in Terre Haute, Indiana to come to Terre Haute Auto to find the perfect used vehicle that fits their lifestyle and their budget. Are you interested in 4x4 trucks for sale so you can have a little off-road fun? We have a great selection of 4x4 trucks for sale. How about one that is strong enough to haul a camper? Like a used Dodge Ram 4x4 truck for sale. Used 4x4 trucks for sale, like this Dodge Ram for sale, come with many features both inside and out that is sure to impress. This used Dodge Ram for sale comes with a leather-wrapped steering wheel and steering wheel audio controls. Steering wheel audio controls are great because you can change the radio station, answer phone calls and turn the volume up or down without ever taking your hands off the wheel. This used Dodge Ram for sale also comes with many safety features. This is sure to put your mind at ease as you drive through the streets of Terre Haute, Indiana in this used 4x4 truck for sale. Including a tire pressure monitoring system, electronic stability control, and multiple airbags. However, the most impressive feature of this used 4x4 truck for sale is the powerful 5.7L V8 engine. The engine on this used 4x4 truck for sale boasts an incredible 390 horsepower. With the remarkable towing capacity that this 4x4 truck provides, you will never have to worry about hitching your trailer up to the back of another truck ever again. This Dodge Ram truck is ready to take on all of your driving needs. Whether it is going to and from work every day, running errands around town or hooking up a camper for a weekend adventure this used 4x4 truck is ready to get the job done. Come to your local Terre Haute, Indiana used car dealership near me and see this used Dodge Ram 4x4 truck for sale at Terre Haute Auto. 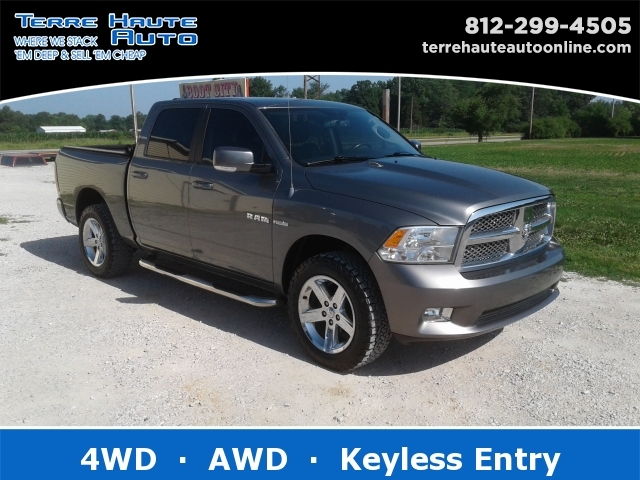 If a used Ram truck for sale is not what you are looking for, come and see one of the many other used trucks for sale at your local used car dealers in Terre Haute, Indiana. Call today to schedule an appointment for a test drive at 812-299-4505. You can find Terre Haute Auto located conveniently at 13350 S US Hwy 41, Terre Haute, IN 47802.